In 2005, Nicholas Negroponte of MIT Labs demonstrated a prototype of a low-cost computer aimed at poor children in developing countries at the World Summit on the Information Society (WSIS). This initiative evolved into the One Laptop Per Child (OLPC) programme with the vision of providing every school child in a developing country with their own computer. The “XO" laptop developed by OLPC is specifically made for primary school students in developing nations including local language support and a rugged design with no movable parts and designed for the extreme environmental conditions in many rural regions such as high heat and humidity. XO laptops have been deployed in over two dozen developing nations. Around 400,000 of these are in Uruguay, the first country in the world to supply all primary school children with their own laptop in 2009, a feat it accomplished in three years. The Government of Uruguay has been strongly supportive of the OLPC program as a way to democratize ICTs, to spread them from privileged urban elites by to less advantaged areas by providing rural children—and hence indirectly their parents as well—with a computer. It notes that: “What was a privilege in 2006 is a right in 2009.”  An egalitarian laptop distribution policy was adopted, starting with rural schools before eventually providing them to students in the capital Montevideo. One of the goals of the Uruguayan plan was to boost overall household computer ownership by leveraging the students taking the laptops home after school. This has resulted in 220,000 new homes with computers including 110,000 in the lowest income families. The Inter-American Development Bank organized a seminar to discuss the Uruguayan program as well as other initiatives in the region. 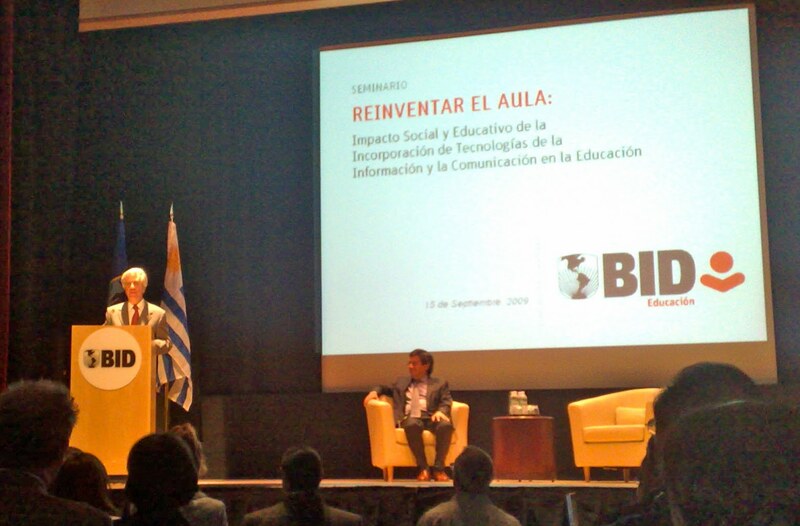 "Reinventing the Classroom: Social and Educational Impact of Information and Communications Technologies in Education" had around one hundred participants from governments, academia, inter-governmental organizations, NGOs and the private sector including the president of Uruguay, Tabaré Vázquez and Nicholas Negroponte (who graciously autographed my old copy of Being Digital). “Education in Uruguay: Laptops for All.” The Economist. 1 October 2009.